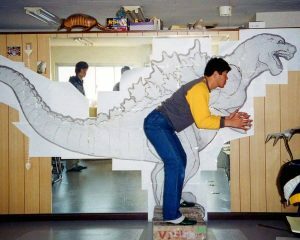 Suit actor Mizuho Yoshida testing the suit profile from Godzilla · Mothra · King Ghidorah: Giant Monsters All-Out Attack (2001). He’s the biggest of the big and the baddest of all Kings, we are welcoming Mizuho Yoshida back to the Kaijucast with an interview recorded at Monsterpalooza earlier this month. Coincidentally, I posted a short interview with this monster man (recorded in the spring of 2016) earlier this year. It is always an amazing experience speaking with a Godzilla suit actor and Yoshida-san is absolutely not an exception. We hope to have him return in the future as well! The new MST3k is now streaming on Netflix – watch it, please! This month we are watching Demeking (2009) and I really don’t know what to expect. This film was released during the kaiju vacuum of the 2009 era. We’ll be watching it on Youtube for the discussion since I never bought this film on any kind of home media.